Quality management concepts for the development of efficient processes help European public administration to strive for modernisation, better public management, increased performance and a stronger stakeholder focus. The Agency is committed to develop and monitor its own management standards and learn from international best practice. We intend to demonstrate our ability to consistently provide a service that meets stakeholders' expectations and applicable regulatory requirements, ultimately a high level of aviation safety and environmental protection in Europe. We also aim at enhancing our services through the effective application of the Integrated Management System, including processes for continual improvement. We intend to ensure our compliance with the applicable management standards, namely EASA Management Standards that take into account ISO 9001 requirements and the Internal Control Standards of the European Commission. The EASA Integrated Management System (IMS), comprising a Quality Management System, is certified against the internationally recognised ISO 9001 Standard for Quality Management Systems. 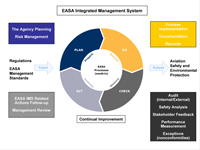 The EASA Integrated Management System (IMS) is designed as to ensure that any additional requirements prescribed by the EU regulatory framework as well as those set forth by international agreements (e.g., ICAO standards on safety programme and safety management system) in the field of aviation safety and environmental protection are taken into account. The EASA IMS is a single integrated system to manage the totality of the Agency's processes in order to meet the organisation's mission and objectives. The EASA IMS will also ensure that quality of services delivered by the Agency equally satisfies the stakeholders without compromising on safety or environmental protection. EASA has implemented an innovative Business Process Management (BPM) solution to improve its performance. This BPM solution helps us to identify which processes make the biggest impact on our activities, thus allowing us to prioritise and improve our processes, and ultimately to be more efficient and effective in achieving our mission and objectives. The end-to-end process map provides an overview of the all EASA core, management, and support processes. It describes the Agency processes by organising and managing its activities to achieve the Agency objectives and create value for our stakeholders. EASA is committed to good governance and drives for continuous improvement in a control environment. To that end, the Internal Audit Section performs targeted audits on key processes, recommending opportunities for improvement, risk mitigation and greater efficiencies.